IAF aircraft attack a terrorist cell in Gaza as it prepares to launch rockets at southern Israel. 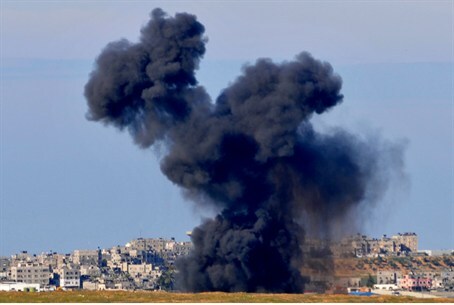 IAF aircraft attacked a terrorist cell in northern Gaza on Monday morning, as it was preparing to launch rockets at southern Israel. The IDF Spokesperson’s Unit said in a statement that the aircraft scored a direct hit. “The IDF will not tolerate any attempt to harm Israeli citizens and IDF soldiers and will continue to act decisively and strongly against anyone who uses terror against Israel,” said the IDF statement. Despite an Egyptian-brokered “ceasefire” recently announced by Hamas, terrorists from Gaza have continued to sproadically fire rockets at southern Israel. Last Tuesday evening, terrorists from Hamas-controlled Gaza fired a barrage of four Grad missiles at the town of Netivot. Israel has submitted a formal complaint to the United Nations Security Council – not the first – over the deadly rocket fire aimed at its civilians by Gaza. The complaint condemned the incessant barrage of short and medium-range missiles launched by Palestinian Authority terrorists from the Hamas-ruled territory over the past week. Israeli Ambassador to the United Nations, Ron Prosor, wrote in his letter to U.N. Secretary-General Ban Ki-moon that one million civilians are living under the risk of being harmed daily in the rocket attacks. He warned the international body that inaction by the Security Council could exacerbate the conflict between Israel and the Palestinian Authority, rather than advance peace.